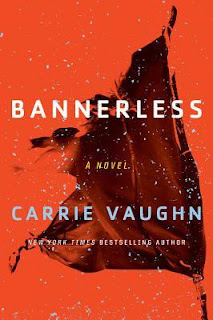 Carrie Vaughn’s “Bannerless” is a science fiction book of ideas. Ostensibly a mystery, this short novel is really an exploration of the ramifications of the effect of scarce resources on society. But unlike the summary on the cover of the book, the main character Enid, an “Investigator” does not expose cracks in foundation of the society. What she does is enforce the laws of this community run society. Essentially, the Investigators are judge, jury and enforcer of the Coast Road rules. They travel from town to town to make sure the Coast Road polities are obeyed. The most stringently enforced rules deal with over-consumption. After the “Fall”, the apocalyptic catastrophe that killed millions and decimated society two generations or so ago, the remaining people had to band together to make it. Small communities sprung up and down the Coast Road, grew their own food, hunted or fished and made do with a small amount of technology that survived plus the books and treatises saved by the founders. Vaughn imagines that birth control would be one of the main technologies that would survive this catastrophe. The Coast Road society uses the ability to control birth and control population to ensure that the towns and households do not over consume scant resources. People are only allowed to have children (obtain a Banner) if the community or their household can show the ability to support more children. And people who get permission proudly display their banners. Needless to say that if people try to illegally gain a child, the Investigators are quick to punish the household by either splitting them up or taking children away from their families and parents or punishing the community by banning children for a time. In Enid’s mind these transgressions should be punished severely. Several times Vaughn depicts Enid’s anger as an Investigator. Her fear of what happened before and her desire to not have it happen again. The novel is split into two halves. Enid and Tomas, her co-Investigator, and mentor, have been called to Serenity, a small community down the Coast Road, where one of the citizens has died under suspicious circumstances. The only mystery is whether the man, who appears to be bannerless, that is born without permission of the Coast Road, and ostracized in Serenity fell or was pushed to his death. Although the “culprit” is easily identified early on, it is Enid’s investigation of the reasons for his death that is the key. Serenity is a town run by a counsel made up of Ariana, Philos and Lee, three heads of households in the town. Enid’s discovers that Ariana requested the investigation, but has ulterior purposes. Philos, who runs the Bounty household, has run roughshod over the town for a while and Ariana wants to take him down. But while Enid pursues her investigation, she runs into Dak, a troubadour that she had journeyed with in her youth. This is the second part of the novel. In a series of timeline shifts, Vaughn skips back and forth from the present to the past. Enid tells of the time before she was an Investigator and went down the Coast Road, visiting various towns and making love with Dak, a sweet playing musician. Enid journey is both a journey of discovery of who she is and who Dak is, but also a reinforcement in many ways of the benefits of the Coast Road society rules. Enid discovers that she wants to be useful and stand on her own merits, while Dak is a little hollow at his core, and Enid discovers does not want to get involved with Investigators or society. His wandering ways are as much a part of his reaction to what happened to him as a kid as Enid strong center are hers. Enid will also run into people in an abandoned pre-fall city, where a woman with three malnourished children is surviving in a nomadic existence. This is a woman who will not accept the population controls of the Coast Road and telling says to Enid, that the Coast Road "takes your children away"
Enid and Tomas investigation of Serenity, Dak, Ariana and Philos will reveal the tensions in a society that values control of resources and rules against freedom to do what you will. In the end, greed and power are always a danger to societal rules. The real question for the reader is whether Vaughn through Enid makes her point. Is the Coast Road’s society just. Can religiously controlling reproduction and resources ensure that a society can grow responsibly? The jury is out for this reader. But Enid is very convinced and diligently pursues punishment for the people who want to break her society’s rules.